When life doesn’t go as planned, which happens to all of us, we have choices. Some of us try to cling on to our hopes that somehow we can make it go as planned, OR we can let go of our expectations and be open to, and learn to, love the life that is waiting for us. The loss of a dream (or plan) is very significant and letting go is hard. It does not happen easily or quickly. In fact, I have been learning to let go and enjoy the very special, lovely things about my daughter, Laura, for 33 years. One significant event comes to mind when I think about choices and letting go. Thirty years ago, there was not an opportunity for Laura to attend her “home” school. At age 3, she was bussed to another typical elementary school where she was placed in a self-contained classroom. Inclusion was just beginning to come to the forefront. I was ok with that … for a while. But by the time she was in second grade, I began to think that there could be significant value in having her in class with her typical peers. So, I made a choice and asked to have Laura placed in the regular class even though the academic gap between her and her peers was growing. I was going to MAKE her life more like the one I had envisioned, I thought. Since this was not the norm, at the time, the school agreed to allow Laura to go to specials (art, music, PE), and be in homeroom and go to lunch with her peers. I was ok with that too. It was a start. Those were parts of her day that she really enjoyed. But what happened next took me by surprise. 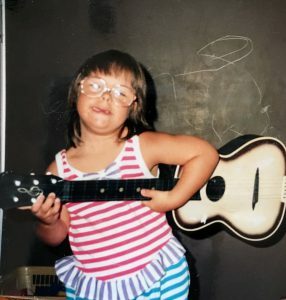 The music teacher attended one of our IEP meetings and told us that Laura was coming to music class twice a week, once with her 2nd grade class and once with her self-contained class. He said that when she came with her peers, she sat in the back away from the other children, sucked her thumb, and did not participate. He observed that when she came with her self-contained class, she sang and danced and played instruments and absolutely loved music. He said that he would have never known her potential had it not been for seeing her in both environments. Wow! Laura was telling us in her own way that she was not comfortable with the choice I had made for her. I had to let go and realize that, maybe this time, she knew what was right for her. So I have learned to listen to Laura! I learned to let go of my expectations and dreams and trusted that she was leading me down her path to a lovely life. 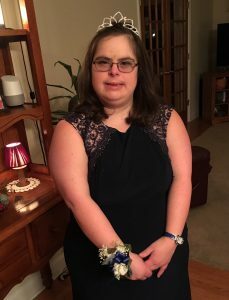 There have been plenty of times she has enjoyed school, work, or activities with her peers but she often prefers to interact with a group of friends with similar abilities and interests. One day, when we were driving to an activity, she said “Mom, I love my life!” What more could I ask for! She shows me over and over again that her choices make her happy! About the Author: Susan and her husband, Brian, live in Middletown with their oldest daughter, Laura. They are also the parents of daughter, Tracy (married to Chad), and son, Chris. Susan currently works as an Associate Teacher at St. Anne’s Episcopal School and Brian is a research engineer with the U.S. Army. Susan has been organizing the teen/adult dances for DSA of DE for over 10 years and serves on the Outreach and Social Committees. She also volunteers with Special Olympics DE as a registration manager for the MOT Area.